New Delhi: Hospitals in towns may have specialist doctors and top-notch facilities, but when it comes to basic immunization, city kids lag their peers from villages. The Economic Survey 2015-16 has called for an expansion of public health facilities in urban areas, as immunization levels there remain poor compared to rural areas. “The percentage of children who are fully immunized is lower in urban areas compared to rural areas in majority of the states, indicating that although the private sector is more widespread in urban areas, the availability of preventive health care is through the public health system, which needs strengthening in urban areas," the survey noted. This observation is based on figures from the National Family Health Surveys. The past decade has shown an interesting trend in immunization of children in India. The National Family Health Survey 2005-06 (NFHS-3) showed that urban areas had higher rates of vaccination. It was the reality of almost all the states. However, the trend has reversed since. Figures from NFHS-4, which has data from only 13 states and two Union Territories, show urban areas are lagging. Experts attribute this reversal to the positive impact of the National Rural Health Mission (NRHM) and the failure of the government to replicate the success in urban areas. “Immunization has increased in rural areas due to investments made in NRHM. The government also launched a National Urban Health Mission, but then brought both the missions under National Health Mission two years ago. But on ground, no work has started in urban areas for primary and preventive healthcare," said Vandana Prasad, a founding member and national convener of the Public Health Resource Network, a national-level initiative to build district-level capacities for achieving NRHM goals. In some states, the gap is stark. 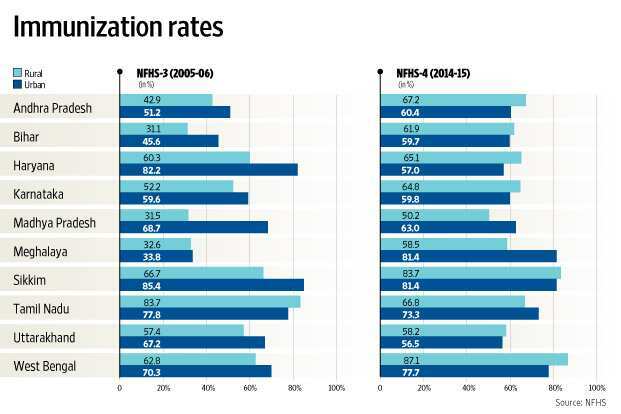 In West Bengal, immunization increased from 62.8% to 87.1% in rural parts, while the improvement is much lower in urban areas (from 70.3% to 77.7%). The gap between urban and rural areas stand at 10% today. Prasad said rural areas do not have specialist doctors and other facilities, but preventive care has reached them. On the other hand, urban areas have better curative care due to the presence of specialists. Almost all super-specialty hospitals, be it private or public, are in urban areas. “But they lack preventive care, which is primarily delivered through government interventions. The difference between urban and rural needs to be bridged for overall improvement of health indicators," said Prasad. India has set itself a target of full immunization by 2020 against seven vaccine-preventable diseases which include diphtheria, whooping cough, tetanus, polio, tuberculosis, measles and hepatitis B. Mission Indradhanush was launched by the central government in December 2014. In addition, vaccination against Japanese Encephalitis and Haemophilus influenza type B will be provided in selected districts and states of the country.